A national report that shows the declining performance of our most disadvantaged school students will cost the country at least $120 billion in coming decades, reinforced Federation’s campaign for fairer public school funding, President Maurie Mulheron said. The Public Education Foundation’s report found that “education inequality is increasing across a wide range of dimensions” and that students at the bottom of the performance curve were suffering the most. The Australian Education Union, joined by principals, teachers and parents from around the country, launched the national Fair Funding Now campaign in Canberra last Tuesday. "2018 should have been a year of celebration for our schools with the biggest investment in schools in decades, but the Turnbull Government tore up the NSW Gonski funding agreement, which will result in a cut of $856 million from NSW public schools over the next two years alone," Mr Mulheron said. 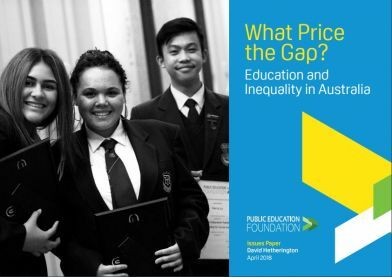 The Public Education Foundation’s What Price the Gap? Education and Inequality in Australia estimates that the cost of students at the bottom falling further below those at the top during 2009-2015 alone was $20 billion. The research used well-established OECD formulas to calculate loss of GDP arising out of Australia’s falling scores during 2009-15 on the PISA (Program for International Student Assessment) results table, and hence the value of education to the nation’s economy. Among the Public Education Foundation’s recommendations for addressing inequality – and keeping the bottom-ranked students from slipping further behind – include targeted teaching approaches and the introduction of second classroom teachers to support underperforming students outside the classroom, especially in disadvantaged communities “and, of course, firm commitment to needs-based funding for schools”. With separate research showing 83 per cent of respondents stating public school funding is very important or fairly important to how they will vote, Mr Mulheron said the Fair Funding Now campaign would be active in every school and reach out to inform the wider community. "We urge all parents, teachers and community members to show their support by signing up for the campaign at FairFundingNow.org.au," Mr Mulheron said.